New flyer – Win a trip for 2 to the 106th Grey Cup in Edmonton! Check out our new flyer with prices in effect until August 12th. 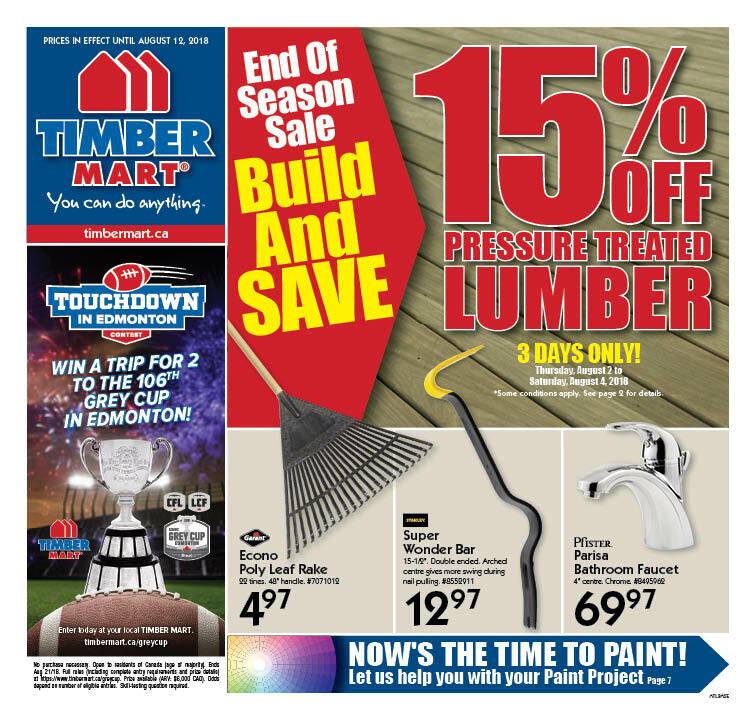 Hot deals on pressure treated lumber, Vicwest metal roofing, exterior paint and stain, and more. 15% off pressure treated lumber for 3 days only, Thursday, August 2 – Saturday, August 4. Build your garage with Timber Mart. From a basic single car garage to multi-car, 2 level garage designs. Timber Mart has the plan to suit your needs. Get 300 Air Miles Bonus Miles with Garage Plan purchase. Win a trip for 2 to the 106th Grey Cup in Edmonton! Enter today at your local Timber Mart. ← New Flyer and Bonus Air Miles Bonus Miles!